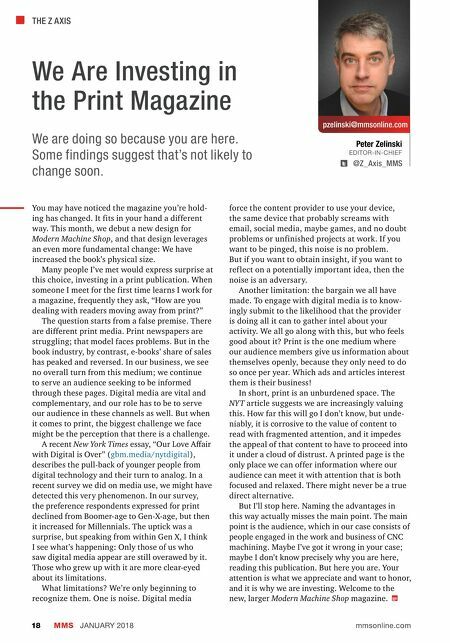 THE Z AXIS MMS JANUARY 2018 18 mmsonline.com pzelinski@mmsonline.com Peter Zelinski EDITOR-IN-CHIEF @Z_Axis_MMS We Are Investing in the Print Magazine You may have noticed the magazine you're hold- ing has changed. It fits in your hand a different way. This month, we debut a new design for Modern Machine Shop, and that design leverages an even more fundamental change: We have increased the book's physical size. Many people I've met would express surprise at this choice, investing in a print publication. When someone I meet for the first time learns I work for a magazine, frequently they ask, "How are you dealing with readers moving away from print?" The question starts from a false premise. There are different print media. Print newspapers are struggling; that model faces problems. But in the book industry, by contrast, e-books' share of sales has peaked and reversed. In our business, we see no overall turn from this medium; we continue to serve an audience seeking to be informed through these pages. Digital media are vital and complementary, and our role has to be to serve our audience in these channels as well. 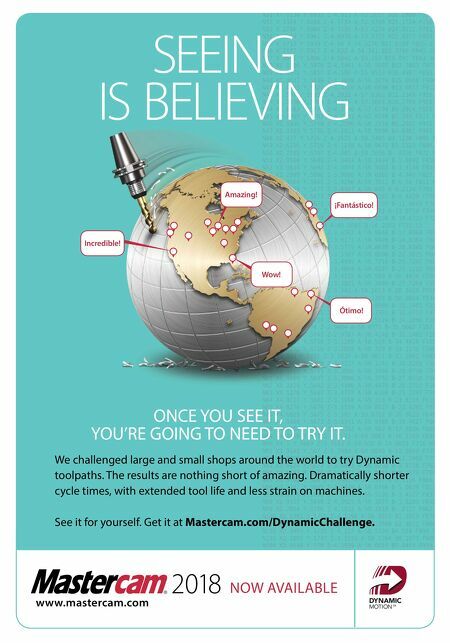 But when it comes to print, the biggest challenge we face might be the perception that there is a challenge. A recent New York Times essay, "Our Love Affair with Digital is Over" ( gbm.media/nytdigital ), describes the pull-back of younger people from digital technology and their turn to analog. In a recent survey we did on media use, we might have detected this very phenomenon. In our survey, the preference respondents expressed for print declined from Boomer-age to Gen-X-age, but then it increased for Millennials. The uptick was a surprise, but speaking from within Gen X, I think I see what's happening: Only those of us who saw digital media appear are still overawed by it. Those who grew up with it are more clear-eyed about its limitations. What limitations? We're only beginning to recognize them. One is noise. Digital media force the content provider to use your device, the same device that probably screams with email, social media, maybe games, and no doubt problems or unfinished projects at work. If you want to be pinged, this noise is no problem. But if you want to obtain insight, if you want to ref lect on a potentially important idea, then the noise is an adversary. Another limitation: the bargain we all have made. To engage with digital media is to know- ingly submit to the likelihood that the provider is doing all it can to gather intel about your activity. We all go along with this, but who feels good about it? Print is the one medium where our audience members give us information about themselves openly, because they only need to do so once per year. Which ads and articles interest them is their business! In short, print is an unburdened space. The NY T article suggests we are increasingly valuing this. How far this will go I don't know, but unde- niably, it is corrosive to the value of content to read with fragmented attention, and it impedes the appeal of that content to have to proceed into it under a cloud of distrust. A printed page is the only place we can offer information where our audience can meet it with attention that is both focused and relaxed. There might never be a true direct alternative. But I'll stop here. Naming the advantages in this way actually misses the main point. The main point is the audience, which in our case consists of people engaged in the work and business of CNC machining. Maybe I've got it wrong in your case; maybe I don't know precisely why you are here, reading this publication. But here you are. Your attention is what we appreciate and want to honor, and it is why we are investing. Welcome to the new, larger Modern Machine Shop magazine. We are doing so because you are here. Some findings suggest that's not likely to change soon.